Cy Twombly was a man obsessed with myth and history—including his own. Shuttling between his stunning homes in Italy and the United States, where he perfected his room-size canvases, he managed his public image carefully and rarely gave interviews. Upon first seeing Twombly’s remarkable paintings, author Joshua Rivkin became obsessed himself with the mysterious artist, and began chasing every lead, big or small—anything that might illuminate who Twombly really was. 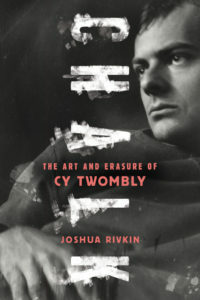 Now, after unprecedented archival research and years of interviews, Rivkin has reconstructed Twombly’s life, from his time at the legendary Black Mountain College, to his canonization in a 1994 MoMA retrospective; from his heady explorations of Rome in the 1950s with Robert Rauschenberg, to the ongoing efforts to shape his legacy after his death. Including previously unpublished photographs, Chalk presents a more personal and searching type of biography than we’ve ever encountered, and brings to life a more complex Twombly than we’ve ever known.